Agreed. Even with Haynes, there was drama. 22 weeks til kickoff! Beat Lp!! Lister will no doubt be missed. But just as we lost Jaylin Brown/A'Darius Carter off the offense in 2017, I guarantee you we'll have guys step up and take over for him. God I love that helmet. Wish we would have a throwback to it for a game or season. Should've been starter from the beginning of the 2017 season....but ya know. Starting to get prepared for the 2019 football season. https://lobohistory.com/schedule.html Full schedule with potential playoff updates updated. JV/Freshmen histories updated. Hoping the JV/Fish schedule will be out here soon. I'm expecting things to be the same as 2018, but there seems to always be a couple differences, especially when we're in a 7 team district. 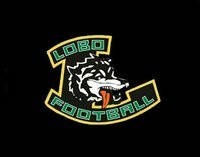 https://lobohistory.com/misc/greenout.html https://lobohistory.com/misc/homecoming.html Both Green Out and Homecoming links have been updated as well. Marshall will be the opponent for both. 2nd appearance on Green Out for Marshall. They lost the first one in 2017. 6th appearance on Homecoming for the Mavs, but first since 1977. Lobos 3-2 in the first five games. Also updated is the Out of State page... https://lobohistory.com/misc/outofstate/louisiana.html Will be Longview's 44th game against an opponent from Louisiana when they meet West Monroe on September 20th, and 50th overall against an Out of State opponent. No doubt West Monroe will be a much better test than Ruston would've been. I like it a lot. Especially knowing it's a two year deal and we get them under Texas rules in 2020. They're not the program they were under Shows, but they're still an elite program and definitely of, if not the, best programs in Louisiana. If we were going to face a team from LA, it should be them. I still don't think they scored that last minute touchdown against us in 2006 to win it, but oh well. Other schedule note, the John Tyler game on the 13th at Rose will start at 7 PM, not 7:30.